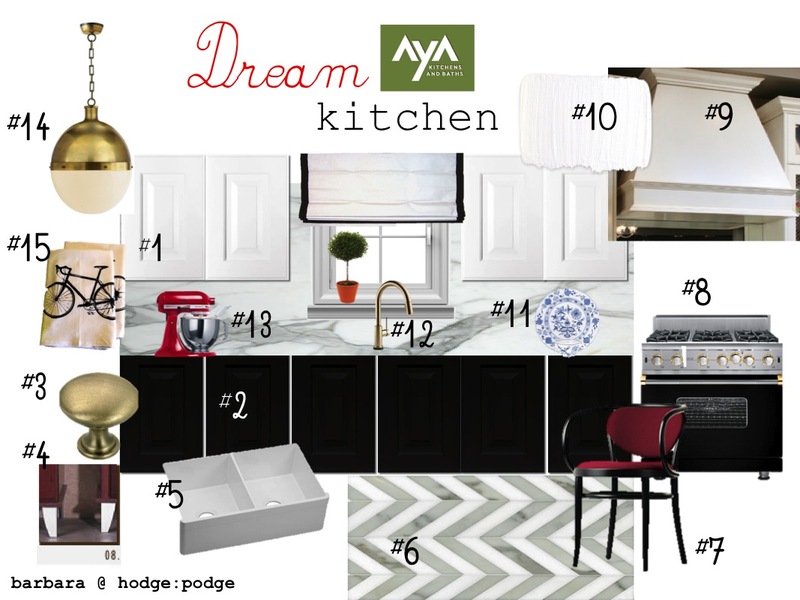 I am beyond excited to share with you my dream kitchen I designed for the AYA "BlogPodium Bound" Kitchen Contest. I would LOVE to attend BlogPodium The Business of Blogging Conference in May but with hundreds of kilometres between Vancouver and Toronto and cost of the weekend standing in my way, I decided to enter this fabulous contest in hopes of winning a flight, BlogPodium ticket and accommodations! What a dream it would be to finally meet those amazing bloggers out east that I have been in touch with for so long. Not to mention to hob nob with companies that would like to work with us! And the icing on the cake would be to hear the every so lovely Nicole Balch from Making it Lovely! I don't have fancy schmancy illustrators or Photoshop, so I just put together my dream kitchen using plain ol' PowerPoint. #4: Aya Triangular Decorative Leg for bottom cabinets in Gold. Keeping my fingers and toes crossed, hope it doesn't get too painful. I don't know who else is entering but I so hope you win! Would love to finally meet you. I'm keeping my fingers crossed for you Barb! Sorry Barbara - just realized I keep calling you Barb. Think I do that in our emails too but you have never called yourself Barb. Guess I feel that I know you well! Can I share your dream with you?! This kitchen looks great! Ohmigosh Barbara, that kitchen is so beautiful! Love that chevron mosaic floor, its spectacular! And the European touches are perfect. I don't often see padded Thonet chairs. This one with the red is great for lingering around a kitchen table. Good Luck Barbara!!!! I would love to see you again. This is lovely! I like the gold accents- makes it different and fresh. And the wine-coloured Bentwood chair- nice touch! So pretty, Barbara! Love the sink and ESPECIALLY the tile. Good luck! Oh Barbara, good luck!!! Your kitchen looks beautiful ..... I know it will be spectacular and win!!! You always win contests, who are you kidding? Fingers, toes and eyes crossed. Love your dream kitchen Barbara! Very YOU and I love the subtle humour to get your hubby to dry dishes. Good Luck! You deserve a win like this! Great design Barbara, best of luck! Would LOVE to finally meet you in person in May! Love all your choices Barb! You did a beautiful job with everything you picked out. I hope you win!!! I love your kitchen Barbara! I love the black, white & red, it's gorgeous and totally you! Best of luck :) So happy that they are giving us this chance, yay for including the West coast!! Very nice design, Barbara :-) I love that you've incorporated your Czech heritage into your dream kitchen :-) The bicycle print towels are cute & really unusual - hope your plan to get hubby to help in the kitchen works! The chevron tile is killer. Love it! Looooooove your design barbara. I'm with JTay...I'm crazy about that chevron floor! Funny thing...I totally was envisioning using that Circa pendant light on my mood board too...but I didn't know the manufacturer and couldn't find it online. Thanks so much for letting me know where this beauty's from! Good luck in the contest Barbara!!! Barb!! love your kitchen and how it's not all white/grey (my two go-to options). Brass is close to my heart these days as well and don't be surprised if you see that faucet in my kitchen soon! wink! oh my goodness...so excited for YOU Barb!!! WEll deserved and very wonderful. Have fun sharing the trip with Nancy....you guys will have lots to tell us!